I wrote the cover package for the latest issue of Word&Way (a Baptist magazine in the Midwest). 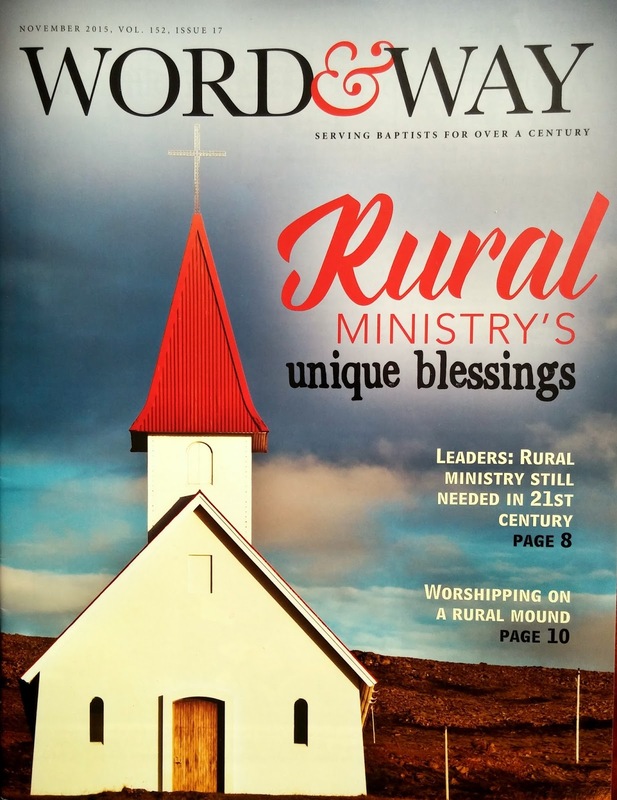 The theme for the issue is "Rural Ministry's Unique Blessings." For a previous issue in September, I wrote about urban church ministry. 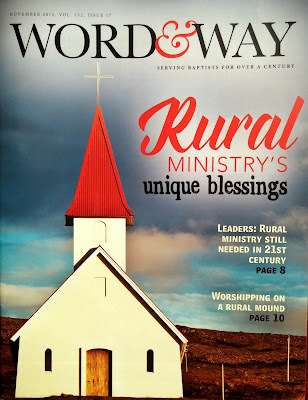 The first article, Leaders: Rural Ministry Still Needed in the 21st Century, considers some of the unique challenges and blessings of rural church ministry. I interviewed Dennis Bickers (southeast area resource minister for the American Baptist Churches of Indiana and Kentucky), Melody Pryor (pastor of First Baptist Church of Stanton, Mo. ), and Mollie Palmer (director of Together for Hope Arkansas, a Cooperative Baptist Fellowship regional initiative). The second article, Worshipping on a Rural Mound, profiles a rural Baptist church. I chose the church I wrote about, Union Mound Baptist Church, since I was already going there to preach last month while working on this package. I pastored the church years ago, so I know most of the people there. They asked me to speak about the recent Baptist World Congress in Durban, South Africa. For the article, I interviewed three members: Thelbert Gott, Sharon Lynch, and Della West. Three photos I took also ran with the article. Sharon Lynch playing the piano.